(3) Southern Force armoured cruisers in reserve off Terschelling. The Harwich Flotillas headed south from Horn Reef LV in the early morning of 28th towards the west of Heligoland, coming into action with destroyer patrols on the way and reaching there around 0800 to sweep west. (5) six light cruisers of 1st LCS (Cdre Goodenough) but the wireless message confirming these additional forces failed to reach either Tyrwhitt or Keyes and contributed to a confusing and complex series of actions in scattered misty conditions. Added to this was the danger to and from the British submarines of not having this information. German destroyers of 1st and 5th TBF's were out in force, joined in ones and twos by old German light cruisers Stettin, Frauenlob, Mainz, Strassburg, Köln, Stralsund, Ariadne, Kolberg and Danzig, some of which had to raise steam before coming out; the state of tide also prevented German battlecruisers joining them before it was too late. By the time the British forces retired just after 1300, Harwich Force had sunk destroyer V.187 and disabled cruisers Frauenlob and Mainz, 1st LCS finished off Mainz, and 1st BCS ships steaming down from the north at midday sank Köln and Ariadne and were only prevented by mist from destroying others; damage was also inflicted on Strassburg, Stettin, destroyer V.1, and torpedo boats D.8, T.33. German losses totalled over 1,000 killed. The following despatches have been received from Vice-Admiral (Acting) Sir David Beatty, K. C. B., M. V. O., D. S. O., H. M. S. "Lion," Rear-Admiral Arthur H. Christian, M. V. O., H. M. S. "Euryalus," Commodore Reginald Y. Tyrwhitt, Commodore (T.), H. M. S. "Arethusa," and Commodore Roger J. B. Keyes, C. B., M. V. O., Commodore (S.), reporting the engagement off Heligoland on Friday, the 28th August. To the Secretary of the Admiralty. H. M. S. "Lion," 1st September, 1914. Sir, I have the honour to report that on Thursday, 27th August, at 5 a.m., I proceeded with the First Battle Cruiser Squadron and First Light Cruiser Squadron in company, to rendezvous with the Rear-Admiral, "Invincible." At 4 a.m., 28th August, the movements of the Flotillas commenced as previously arranged, the Battle Cruiser Squadron and Light Cruiser Squadron supporting. The Rear Admiral, "Invincible, "with "New Zealand" and four Destroyers having joined my flag, the Squadron passed through the pre-arranged rendezvous. At 8. 10 a.m. I received a signal from the Commodore (T), informing me that the Flotilla was in action with the enemy. This was presumably in the vicinity of their pre-arranged rendezvous. From this time until 11 a.m. I remained about the vicinity ready to support as necessary, intercepting various signals, which contained no information on which I could act. At 11 a.m. the Squadron was attacked by three Submarines. The attack was frustrated by rapid manoeuvring and the four Destroyers were ordered to attack them. Shortly after 11 a.m., various signals having been received indicating that the Commodore (T) and Commodore (S) were both in need of assistance, I ordered the Light Cruiser Squadron to support the Torpedo Flotillas. Later I received a signal from the Commodore (T), stating that he was being attacked by a large Cruiser, and a further signal informing me that he was being hard pressed and asking for assistance. The Captain (D), First Flotilla, also signalled that he was in need of help. From the foregoing the situation appeared to me critical. The Flotillas had advanced only ten miles since 8 a.m., and were only about twenty-five miles from two enemy bases on their flank and rear respectively. Commodore Goodenough had detached two of his Light Cruisers to assist some Destroyers earlier in the day, and these had not yet rejoined. (They rejoined at 2. 30 p.m.) As the reports indicated the presence of many enemy ships - one a large Cruiser - I considered that his force might not be strong enough to deal with the situation sufficiently rapidly, so at 11. 30 a.m. the Battle Cruisers turned to E. S. E., and worked up to full speed. It was evident that to be of any value the support must be overwhelming and carried out at the highest speed possible. I had not lost sight of the risk of Submarines, and possible sortie in force from the enemy's base, especially in view of the mist to the South-East. Our high speed, however, made submarine attack difficult, and the smoothness of the sea made their detection comparatively easy. I considered that we were powerful enough to deal with any sortie except by a Battle Squadron, which was unlikely to come out in time, provided our stroke was sufficiently rapid. At 12. 15 p.m. "Fearless" and First Flotilla were sighted retiring West. At the same time the Light Cruiser Squadron was observed to be engaging an enemy ship ahead. They appeared to have her beat. I then steered N. E. to sounds of firing ahead, and at 12. 30 p.m. sighted "Arethusa" and Third Flotilla retiring to the Westward engaging a Cruiser of the "Kolberg" class on our Port Bow. I steered to cut her off from Heligoland, and at 12. 37 p.m. opened fire. At 12. 42 the enemy turned to N. E., and we chased at 27 knots. At 12. 56 p.m. sighted and engaged a two-funnelled Cruiser ahead. "Lion" fired two salvoes at her, which took effect, aud she disappeared into the mist, burning furiously and in a sinking condition. In view of the mist and that she was steering at high speed at right angles to "Lion, " who was herself steaming at 28 knots, the "Lion's" firing was very creditable. Our Destroyers had reported the presence of floating mines to the Eastward and I considered it inadvisable to pursue her. It was also essential that the Squadrons should remain concentrated, and I accordingly ordered a withdrawal. The Battle Cruisers turned North and circled to port to complete the destruction of the vessel first engaged. She was sighted again at 1. 25 p.m. steaming S. E. with colours still flying. "Lion" opened fire with two turrets, and at 1. 35 p.m., after receiving two salvoes, she sank. The four attached Destroyers were sent to pick up survivors, but I deeply regret that they subsequently reported that they searched the area but found none. At 1. 40 p.m. the Battle Cruisers turned to. the Northward, and "Queen Mary" was again attacked by a Submarine. The attack was avoided by the use of the helm. "Lowestoft" was also unsuccessfully attacked. The Battle Cruisers covered the retirement until nightfall. By 6 p.m., the retirement having been well executed and all Destroyers accounted for, I altered course, spread the Light Cruisers, and swept northwards in accordance with the Commander-in-Chief's orders. At 7. 45 p.m. I detached "Liverpool" to Rosyth with German prisoners, 7 officers and 79 men, survivors from "Mainz. " No further incident occurred. Sir, I have the honour to report that in accordance with your orders a reconnaissance in force was carried out in the Heligoland Bight on the 28th August, with the object of attacking the enemy's Light Cruisers and Destroyers. The forces under my orders (viz., the Cruiser Force, under Rear-Admiral H. H. Campbell, C. V. O., "Euryalus," "Amethyst," First and Third Destroyer Flotillas and the Submarines) took up the positions assigned to them on the evening of the 27th August, and, in accordance with directions given, proceeded during the night to approach the Heligoland Bight. The Cruiser Force under Rear-Admiral Campbell, with "Euryalus "(my Flagship) and "Amethyst," was stationed to intercept any enemy vessels chased to the westward. At 4. 30 p.m. on the 28th August these Cruisers, having proceeded to the eastward, fell in with "Lurcher" and three other Destroyers, and the wounded and prisoners in these vessels were transferred in boats to "Bacchante" and "Cressy," which left for the Nore. "Amethyst" took "Laurel" in tow, and at 9. 30 p.m. "Hogue" was detached to take "Arethusa" in tow. This latter is referred to in Commodore R. Y. Tyrwhitt's report, and I quite concur in his remarks as to the skill and rapidity with which this was done in the dark with no lights permissible. Commodore Reginald Y. Tyrwhitt was in command of the Destroyer Flotillas, and his report is enclosed herewith. His attack was delivered with great skill and gallantry, and he was most ably seconded by Captain William F. Blunt, in "Fearless," and the Officers in command of the Destroyers, who handled their vessels in a manner worthy of the best traditions of the British Navy. Commodore Roger J. B. Keyes, in "Lurcher," had on the 27th August, escorted some Submarines into positions allotted to them in the immediate vicinity of the enemy's coast. On the morning of the 28th August, in company with "Firedrake, " he searched the area to the southward of the Battle Cruisers for the enemy's Submarines, and subsequently, having been detached, was present at the sinking of the German Cruiser "Mainz," when he gallantly proceeded alongside her and rescued 220 of her crew, many of whom were wounded. Subsequently he escorted "Laurel" and "Liberty " out of action, and kept them, company till Rear-Admiral Campbell's Cruisers were sighted. (a) Lieutenant-Commander Ernest W. Leir. His coolness and resource in rescuing the crews of the "Goshawk's" and "Defender's" boats at a critical time of the action were admirable. (b) Lieutenant-Commander Cecil P. Talbot. In my opinion, the bravery and resource of the Officers in command of Submarines since the war commenced are worthy of the highest commendation. H. M. S. "Lowestoft, ", 26th September, 1914. Sir, I have the honour to report that at 5 a.m. on Thursday, 27th August, in accordance with orders received from Their Lordships, I sailed in "Arethusa," in company with the First and Third Flotillas, except "Hornet," "Tigress," "Hydra," and "Loyal," to carry out the prearranged operations, H. M. S. "Fearless" joined the Flotillas at sea that afternoon. At 6. 53 a.m. on Friday, 28th August, an enemy's Destroyer was sighted, and was chased by the 4th Division of the Third Flotilla. From 7. 20 to 7. 57 a.m. "Arethusa" and the Third Flotilla were engaged with numerous Destroyers and Torpedo Boats which were making for Heligoland; course was altered to port to cut them off. 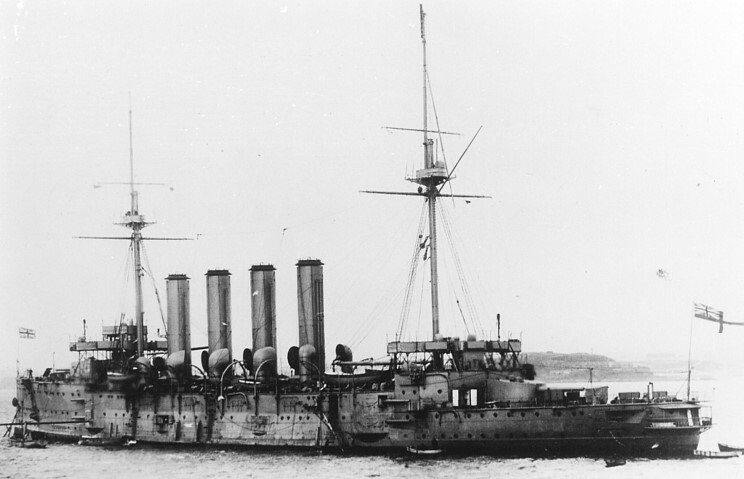 Two Cruisers, with 4 and 2 funnels respectively, were sighted on the port bow at 7. 57 a.m., the nearest of which was engaged. "Arethusa" received a heavy fire from both Cruisers and several Destroyers until 8. 15 a.m., when the four-funnelled Cruiser transferred her fire to "Fearless." Close action was continued with the two-funnelled Cruiser on converging courses until 8. 25 a.m., when a 6-inch projectile from "Arethusa" wrecked the fore bridge of the enemy, who at once turned away in the direction of Heligoland, which was sighted slightly on the starboard bow at about the same time. During this action "Arethusa" had been hit many times, and was considerably damaged; only one 6-inch gun remained in action, all other guns and torpedo tubes having been temporarily disabled. Lieutenant Eric W. P. Westmacott (Signal Officer) was killed at my side during this action. I cannot refrain from adding that he carried out his duties calmly and collectedly, and was of the greatest assistance to me. A fire occurred opposite No. 2 gun port side caused by a shell exploding some ammunition, resulting in a terrific blaze for a short period and leaving the deck burning. This was very promptly dealt with and extinguished by Chief Petty Officer Frederick W. Wrench, O.N. 158630. The Flotillas were reformed in Divisions and proceeded at 20 knots. It was now noticed that "Arethusa's" speed had been reduced, "Fearless" reported that the 3rd and 5th Divisions of the First Flotilla had sunk the German Commodore's Destroyer and that two boats' crews belonging to "Defender" had been left behind, as our Destroyers had been fired upon, by a German Cruiser during their act of mercy in saving the survivors of the German Destroyer. At 10 a.m., hearing that Commodore (S) in "Lurcher" and "Firedrake" were being chased by Light Cruisers, I proceeded to his assistance with "Fearless" and the First Flotilla until 10. 37 a.m., when, having received no news and being in the vicinity of Heligoland, I ordered the ships in company to turn to the westward. At 10. 55 a.m. a four-funnelled German Cruiser was sighted, and opened a very heavy fire at about 11 o'clock. Our position being somewhat critical, I ordered "Fearless" to attack, and the First Flotilla to attack with torpedoes, which they proceeded to do with great spirit. The Cruiser at once turned away, disappeared in the haze and evaded the attack. About 10 minutes later the same Cruiser appeared on our starboard quarter. Opened fire on her with both 6-inch guns; "Fearless" also engaged her, and one Division of Destroyers attacked her with torpedoes without success. The state of affairs and our position was then reported to the Admiral Commanding Battle Cruiser Squadron. We received a very severe and almost accurate fire from this Cruiser; salvo after salvo was falling between 10 and 30 yards short, but not a single shell struck; two torpedoes were also fired at us, being well directed, but short. The Cruiser was badly. damaged by "Arethusa's" 6-inch guns and a splendidly directed fire from "Fearless," and she shortly afterwards turned away in the direction of Heligoland. Proceeded, and four minutes later sighted the three-funnelled Cruiser "Mainz." She endured a heavy fire from "Arethusa" and "Fearless" and many Destroyers. After an action of approximately 25 minutes she was seen to be sinking by the head, her engines stopped, besides being on fire. At this moment the Light Cruiser Squadron appeared, and they very speedily reduced the "Mainz" to a condition which must have been indescribable. I then recalled "Fearless" and the Destroyers, and ordered cease fire. We then exchanged broadsides with a large, four-funnelled Cruiser on the starboard quarter at long range, without visible effect. I then proceeded with 14 Destroyers of the Third Flotilla and 9 of the First Flotilla. "Arethusa's" speed was about 6 knots until 7 p.m., when it was impossible to proceed any further, and fires were drawn in all boilers except two, and assistance called for. At 9. 30 p.m. Captain Wilmot S. Nicholson, of the "Hogue, " took my ship in tow in a most seamanlike manner, and, observing that the night was pitch dark and the only lights showing were two small hand lanterns, I consider his action was one which deserves special notice from Their Lordships. I would also specially recommend Lieutenant-Commander Arthur P. N. T'horowgood, of ''Arethusa," for the able manner he prepared the ship for being towed in the dark. H. M. Ship under my command was then towed. to the Nore, arriving at 5 p.m. on the 29th August. Steam was then available for slow speed, and the ship was able to proceed to Chatham under her own steam. I beg again to call attention to the services rendered by Captain W. F. Blunt, of H. M. S. "Fearless," and the Commanding Officers of the Destroyers of the First and Third Flotillas, whose gallant attacks on the German Cruisers at critical moments undoubtedly saved "Arethusa" from more severe punishment and possible capture. I cannot adequately express my satisfaction and pride at the spirit and ardour of my Officers and Ship's Company, who carried out their orders with the greatest alacrity under the most trying conditions, especially in view of the fact that the ship, newly built, had not been 48 hours out of the Dockyard before she was in action. Lieutenant-Commander Arthur P. N. T'horowgood, First Lieutenant, and in charge of the After Control. Lieutenant-Commander Ernest K. Arbuthnot (G.), in charge of the Fore Control. Sub-Lieutenant Clive A. Robinson, who worked the range-finder throughout the entire action with extraordinary coolness. Assistant Paymaster Kenneth E. Badcock, my Secretary, who attended me on the bridge throughout the entire action. Mr. James D. Godfrey, Gunner (T.), who was in charge of the torpedo tubes. Armourer Arthur F. Hayes, O.N. 34202G (Ch.). Second Sick Berth Steward George Trolley, O.N. M. 296 (Ch.). Chief Yeoman of Signals Albert Fox, O.N. 194656 (Po. ), on fore bridge during entire action. Chief Petty Officer Frederick W. Wrench, O.N. 158630 (Ch.) (for ready resource in extinguishing fire caused by explosion of cordite). Private Thomas Millington, R.M.L.I., No. Ch. 17417. Private William J. Beirne, R.M.L.I., No. Ch. 13540. First Writer Albert W. Stone, O.N. 346080 (Po.). Mr. Robert M. Taylor, Gunner, for coolness in action under heavy fire. Engineer Lieutenant-Commander Charles de F. Messervy. Commander The Hon. Herbert Meade, who took his Division into action with great coolness and nerve, and was instrumental in sinking the German Destroyer "V. 187," and, with the boats of his Division, saved the survivors in a most chivalrous manner. Commander Geoffrey Mackworth, who, with his Division, most gallantly seconded Commander Meade, of "Goshawk. " Lieutenant-Commander Malcolm L. Goldsmith, whose ship was seriously damaged, taken in tow, and towed out of action by "Fearless. " Sub-Lieutenant George H. Faulkner, who continued to fight his gun after being wounded. Mr. Charles Powell, Acting Boatswain, O.N. 209388, who was gunlayer of the centre gun, which made many hits. He behaved very coolly, and set a good example when getting in tow and clearing away the wreckage after the action. Edward Naylor, Petty Officer, Torpedo Gunner's Mate, O.N. 189136, who fired a torpedo which the Commanding Officer of "Laertes" reports undoubtedly hit the "Mainz, "and so helped materially to put her out of action. Stephen Pritchard, Stoker Petty Officer, O.N. 285152, who very gallantly dived into the cabin flat immediately after a shell had exploded there, and worked a fire hose. Frederick Pierce, Stoker Petty Officer, O.N. 307943, who was on watch in the engine room and behaved with conspicuous coolness and resource when a shell exploded in No. 2 boiler. Commander Frank F. Rose, who most ably commanded his vessel throughout the early part of the action, and after having been wounded in both legs, remained on the bridge until 6 p.m., displaying great devotion to duty. Lieutenant. Charles R. Peploe, First Lieutenant, who took command after Commander Rose was wounded, and continued the action till its close, bringing his Destroyer out in an able and gallant manner under most trying conditions. Engineer Lieutenant-Commander Edward H. T. Meeson, who behaved with great coolness during the action, and steamed the ship out of action, although she had been very severely damaged by explosion of her own lyddite, by which the after funnel was nearly demolished. He subsequently assisted to carry out repairs to the vessel. Sam Palmer, Leading Seaman (G.L.2) O.N. 179529, who continued to fight his gun until the end of the action, although severely wounded in the leg. Albert Edmund Sellens, Able Seaman (L.T.O. ), O.N. 217245, who was stationed at the fore torpedo tubes; he remained at his post throughout the entire action, although wounded in the arm, and then rendered first aid in a very able manner before being attended to himself. Alfred Britton, Stoker Petty Officer, O.N. 289893, who both showed great coolness in putting out a fire near the centre gun after an explosion had occurred there; several lyddite shells were lying in the immediate vicinity. William R. Boiston, Engine Room Artificer, 3rd class, O.N. M. 1369, who showed great ability and coolness in taking charge of the after boiler room during the action, when an explosion blew in the after funnel and a shell carried away pipes and seriously damaged the main steam pipe. William H. Gorst, Stoker Petty Officer, O.N. 305616. Edward Crane, Stoker Petty Officer, O.N. 307275. Harry Wilfred Hawkes, Stoker 1st class, O.N. K. 12086. John W. Bateman, Stoker 1st class, O.N. K. 12100. The late Lieutenant-Commander Nigel K. W. Barttelot commanded the "Liberty " with great skill and gallantry throughout the action. He was a most promising and able Officer, and I consider his death is a great loss to the Navy. Engineer Lieutenant-Commander Frank A. Butler, who showed much resource in effecting repairs during the action. Lieutenant Henry E. Horan, First Lieutenant, who took command after the death of Lieutenant-Commander Barttelot, and brought his ship out of action in an extremely able and gallant manner under most trying conditions. Mr. Harry Morgan, Gunner (T), who carried out his duties with exceptional coolness under fire. Chief Petty Officer James Samuel Beadle, O.N. 171735, who remained at his post at the wheel for over an hour after being wounded in the kidneys. John Galvin, Stoker, Petty Officer, O.N. 279946, who took entire charge, under the Engineer Officer, of the party who stopped leaks, and accomplished his task although working up to his chest in water. Mr. Ernest Roper, Chief Gunner, who carried out his duties with exceptional coolness under fire. R. Y. TYRWHITT, Commodore (T). H. M. S. "Maidstone,", 11th. October, 1914. ..... At midnight on the 26th August, I embarked in the "Lurcher," and, in company with "Firedrake" and Submarines "D. 2," "D. 8," "E. 4," "E. 5, " "E. 6," "E. 7," "E. 8," and "E. 9" of the Eighth Submarine Flotilla, proceeded to take part in the operations in the Heligoland Bight arranged for the. 28th August. The Destroyers scouted for the Submarines until nightfall on the 27th, when the latter proceeded independently to take up various positions from which they could cooperate with the Destroyer Flotillas on the following morning. At daylight on the 28th August the "Lurcher" and "Firedrake" searched the area, through which the Battle Cruisers were to advance, for hostile Submarines, and then proceeded towards Heligoland in the wake of Submarines "E. 6," "E. 7," and "E. 8," which were exposing themselves with the object of inducing the enemy to chase them to the westward. On approaching Heligoland, the visibility, which had been very good to seaward, reduced to 5, 000 to 6, 000 yards, and this added considerably to the anxieties and responsibilities of the Commanding Officers of Submarines, who handled their vessels with coolness and judgment in an area which was necessarily occupied by friends as well as foes. Low visibility and calm sea are the most unfavourable conditions under which Submarine can operate, and no opportunity occurred of closing with the Enemy's Cruisers to within torpedo range. Lieutenant-Commander Ernest W. Leir, Commanding Submarine "E. 4," witnessed the sinking of the German Torpedo Boat Destroyer "V. 187" through his periscope, and, observing a Cruiser of the "Stettin" class close, and open fire on the British Destroyers which had lowered their boats to pick up the survivors, he proceeded to attack the Cruiser, but she altered course before he could get within range. After covering the retirement of our Destroyers, which had had to abandon their boats, he returned to the latter, and embarked a Lieutenant and nine men of "Defender, "who had been left behind. The boats also contained two Officers and eight men of "V. 187," who were unwounded, and eighteen men who were badly wounded. As he could not embark the latter, Lieutenant-Commander Leir left one of the Officers and six unwounded men to navigate the British boats to Heligoland. Before leaving he saw that they were provided with water, biscuit, and a compass. One German Officer and two men were made prisoners of war. Lieutenant-Commander Leir's action in remaining on the surface in the vicinity of the enemy and in a visibility which would have placed his vessel within easy gun range of an enemy appearing out of the mist, was altogether admirable. (Signed) ROGER KEYES, Commodore (S). Many of the honours and gallantry awards listed in the London Gazette, do not identify ships or battles/campaigns. Therefore the following listings may be incomplete. To be an Ordinary Member of the Military Division of the Third Class or Companion. Captain Reginald Yorke Tyrwhitt (Commodore, Second Class), Royal Navy. To be Companions of the Distinguished Service Order. Commander the Hon. Herbert Meade. Lieutenant Frederick Arthur Peere Williams-Freeman. Squadron-Commander Spenser Douglas Adair Grey. Flight-Lieutenant. Reginald Lennox George Marix. Lieutenant Charles Herbert Collet, Royal Marine Artillery. To receive the Distinguished Service Cross (late Conspicuous Service Cross). Lieutenant Charles Manners Sutton Chapman. To receive the Conspicuous Gallantry Medal. Ernest Randall Cremer, Able Seaman, O.N. 214, 235. To receive the Distinguished Service Medal. Ernest Edward Stevens, Chief Engine Room Artificer (1st class), O.N. 269, 451. Arthur Cecil Smith, Acting Chief Engine Room Artificer (2nd class), O.N. 270, 627. Albert Fox, Chief Yeoman of Signals, O.N. 194, 656. Frederick William Walter Wrench, Chief Petty Officer, O.N. 158, 630. George Henry Sturdy, Chief Stoker, O.N. 285, 547. Edward Charles Taylor, Chief Stoker, O.N. 283, 225. James William Armstrong, Engine Room Artificer, 1st class, O.N. 270, 451. William Rochester Boiston, Engine Room Artificer, 3rd class, O.N. M. 1369. James Samuel Beadle, Acting Chief Petty Officer, O.N. 171, 733. Edward Naylor, Petty Officer, O.N. 189, 136. Arthur Hiscock, Petty Officer, O.N. 191, 423. Alfred George Antram, Petty Officer, O.N. 223, 207. Harry Weate, Petty Officer, O.N. 174, 893. Stephen Pritchard, Stoker Petty Officer, O.N. 285, 152. Frederick Pierce, Stoker Petty Officer, O.N. 307, 943. Alfred Britton, Stoker Petty Officer, O.N. 289, 893. John Galvin, Stoker Petty Officer, O.N. 279, 946. Arthur Fred Hayes, Armourer, O.N. 342, 026. Frederick Charles Langridge, Stoker, 1st class, O.N. K. 6765. Sam Palmer, Leading Seaman, O.N. 179, 529. William Arthur McGill, Leading Seaman, O.N. 217, 484. Albert Edmund Sellens, Able Seaman, O.N. 217, 245. Henry Hurlock, Able Seaman, O.N. 238, 126. Engineer Lieutenant-Commander Edward Hickman Tucker Meeson, His Majesty's Ship "Laurel." To receive the Distinguished Service Cross. Lieutenant George Lionel Davidson, late His Majesty's Ship "Loyal, "
Chief Petty Officer Archibald Charles Bishop, O.N. 142578.